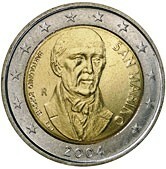 Details relating to the San Marino Commemorative of 2004. The coin commemorates the 100th anniversary of the erection of the memorial for Bartolomeo Borghes. This commemorative coin is particularly appropriate as Borghes’ main claim to fame was that of a fanatical coin collector (numismatist). Indeed, he was a key figure in raising coin collecting to an organized discipline. He arranged and catalogued a number of coin collections, most notably those of the Vatican. Borghes was also an historian who wrote an authoritative work detailing the chronology of Roman history. In the inner circle is a bust of Borghesi. Around the edge of the inner circle,on the left is his name “BARTOLEMEO BORCHESI” and on the right the name of the issuing country “SAN MARINO”. The initials of the designer “E.L.F.” are seen at seven o’clock and the mint sign is “R” is on the right next to the collar. The year of issue 2004 is in the outer circle at the bottom. This practice was later not allowed as the twelve stars of the EU are supposed to appear uninterrupted. Return from San Marino Commemorative 2004 to euro coin collector.